Getting the wood to make koa guitar and ukulele sets is becoming increasingly difficult. A lot of koa is being purchased in log form and shipped out of State that way. I have supplied instrument sets to individual luthiers for about 31 years. Working with raw wood has always been enjoyable for me. By selling sets, I am able to continue finding new wood for myself. I hope to continue to be able to supply sets for the near future, but market pressures from Mainland , international sources, as well as local buyers are driving the prices way up for us locally. Prices for my sets are going up significantly to offset what I have to pay for the wood, if I can even get wood! 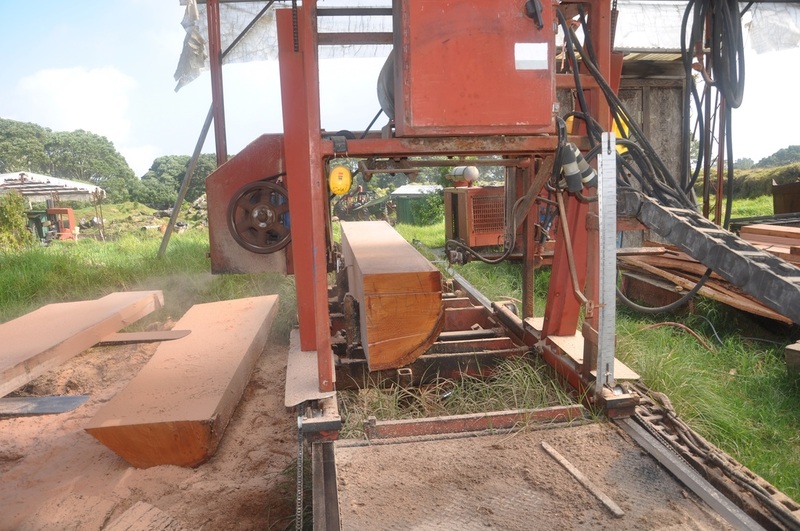 Milling Spanish cedar on the Hawaii Island 2016. Koa forest in the background. Shipping is by Priority Mail in the U.S. or Priority International Mail outside the U.S.
Payment for sets can be by wire transfer or PayPal, or by check for established accounts If you want to use a CC, you can do that through PayPal.